The Russian trawler Dalny Vostok sank in the Sea of Okhotsk in the Far East during the early hours of April 2. Fifty-six bodies have already been recovered from the waters and while 63 survivors have been rescued, 13 sailors remain unaccounted for. Emergency services are speculating that the ship collided with an obstacle, though according to the Ministry of Emergency Situations, technical security violations were responsible for the disaster. Fifty-six are dead and 13 missing after a Russian trawler sank in the Sea of Okhotsk in the Far East during the early hours of April 2. According to reports from emergency services, the Dalny Vostok went down in freezing waters off the Kamchatka Peninsula, around 300 kilometers (200 miles) south of Magadan, without even sending out an SOS signal. The ship took just 15 minutes to sink completely. 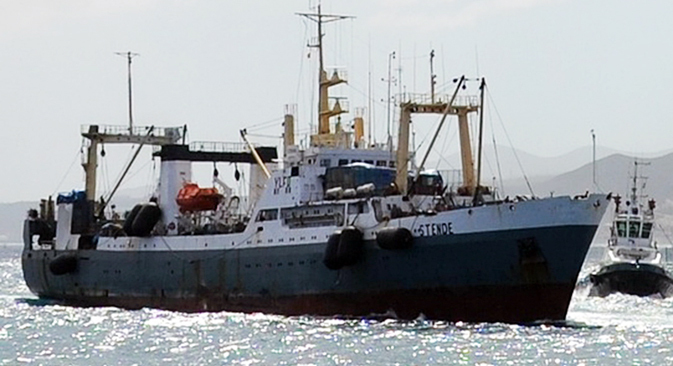 The trawler was carrying a crew of 132, 78 of whom were Russian citizens. Of the remaining crew members, 42 were from Myanmar, five from Vanuatu, three from Latvia, and four from Ukraine. Sixty-three sailors have been rescued and remain in a serious condition. All of the survivors are suffering from hypothermia and several remain unconscious. Searches are continuing for the 13 sailors still unaccounted for. According to sources at the operations headquarters for dealing with the aftermaths of shipwrecks, the most likely reason for the tragedy was a collision with an obstacle, possibly ice. The hypothesis is that the impact on the vessel’s hull caused a deformation resulting in a partial fracture, as a result of which water began to enter the ship’s machine room. But the Ministry of Emergency Situations (MChS) does not agree with the “collision with an obstacle” version of events. “According to preliminary data, the crew had violated fishing rules. The ship, which had low fuel reserves, lifted a trawl weighing 80 tons, letting the second one go. In rough sea conditions the ship ‘caught a roll’ and started to sink,” the regional representative for the MChS General Directorate told the Interfax news agency. It is not excluded that strong winds could have been an additional factor. The deputy chairman of the Kamchatka Territory administration, Sergei Khabarov, also told the news agency TASS that the most likely reason for the disaster was the violation of safety rules and said the ship had been trying to haul a 100-ton seine net. “The captain and first mate of the ship were killed. The information we now have was obtained from the third mate, who survived,” said Khabarov. A source told Russian news outlet Lifenews that the 48-year-old captain of the trawler, Alexander Pritotsky, who perished in the disaster, was one of the best captains in the Far East and held records for catches. “But one of the problems in our business is that captains try too hard in moments of excitement and take risks,” said the source. “Investigators are now seizing documents on the condition of the vessel and documents for the right of the vessel to sail, as well as others,” the representative of the ICR Far East investigative authority for transport, Oxana Polshakova, told RIA Novosti. She also said that they are planning to question surviving crew members. A representative of the company Magellan, which owns the ship, has already told RIA Novosti that the trawler was fully seaworthy according to all technical parameters. “The trailer underwent repairs in late 2014, so the issue over whether the ship sunk due to technical violations is groundless,” said the representative, who added that the crew had been in regular contact and no technical issues had been reported during the last communication session. At the moment, water temperatures in the area of the wreck are at about 0 degrees while wind speed is 14 m/s and swells are category 3. According to RIA Novosti’s source in the emergency services, the chances are extremely slim that those crew members yet to be found are still alive in the icy waters. Even in wetsuits, it is only possible to survive such conditions for 15-20 minutes. Magellan has already promised compensation to the families of the lost and injured sailors. The company will also pay the costs for transporting the bodies of those who were killed.